Battersea Power Station has been an iconic London landmark for many years. It is currently in the process of being redeveloped into a one-of-a-kind development offering exceptional homes, shops, restaurants and leisure facilities. Those lucky enough to live within the new development will benefit from a state-of-the-art gym, yoga studio, cinema, theatre, hotel rooms for guests of residents and concierge service. The development will also boast beautifully landscaped roof gardens with magnificent views across London and areas for picnics, barbeques, fitness, and play. Battersea Power Station has an incredibly bright future, but how much do you really know about its past? Read on to find out more about Battersea Power Station – the past, present, and future. During the 1920’s power in the UK was provided by various small power stations which were run by different companies, they mainly serviced different industries with only the surplus being made available to the public. Due to high cost, contentious competition and different systems being used the Government decided that a single entity owned by the public should be created to provide people with electricity. This didn’t happen for about 30 years and in the interim, the London Power Company was formed by private owners in 1925. The initial plans to build Battersea Power Station in 1927 were met with angry protests, people were concerned the pollution would be harmful to the buildings and parks in the surrounding areas. In the end, however, permission was granted for a large power station to be built in Battersea. The now iconic building was designed by Sir Giles Gilbert Scott, also famous for giving us Liverpool Cathedral, Waterloo Bridge, and the classic red telephone box. Battersea Power Station and the surrounding area is now entering into the next phase in its history as a unique, modern community. New buildings are starting to complete, the first residents are moving in and new parkland has made the riverside in front of the power station accessible to the public for the first time in 90 years. The old power station itself will house shopping and leisure facilities and will even have its own brand new tube station. A glass lift will take those with a head for heights up to a viewing platform at the top of one of the chimneys (all four of which have been replaced with exact replicas of the originals) where you can take in the awe-inspiring view across the city. As well as high-end apartments, businesses will be moving into the new commercial units and office spaces; the biggest of which so far is Apple who will be opening their new UK headquarters at Battersea Power Station. 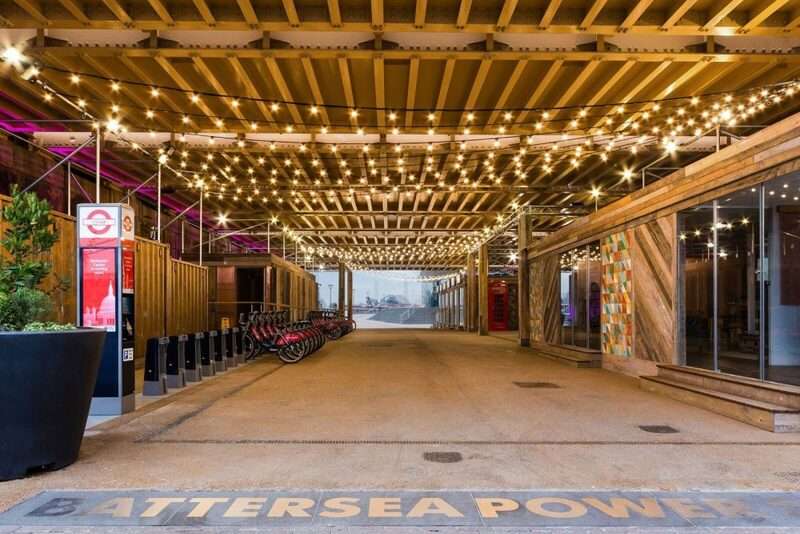 Battersea Power Station and the surrounding areas are in an ongoing process of regeneration, with more people moving in and the shops and businesses opening this newly rejuvenated area is going to become one of London’s great riverside destinations. As well as the shops, restaurants and bars there will be various leisure facilities, flexible space for local entrepreneurs and a public health centre. Not just another development, Battersea Power Station is on course to be somewhere people want to spend their spare time, visit, socialise and raise families. Public spaces are being designed to encourage interaction and a real feel of community amongst residents and visitors. There will also be new transport links for SW8 and SW11, with new Underground Stations opening at Battersea Power Station and Nine Elms; these are due to complete in 2020, providing faster and more direct travel to and from the area. A new jetty will be put in place so that the Thames river bus route can be extended to connect Battersea to Westminster, Southbank, Blackfriars, Embankment, Tower Bridge, Canary Wharf and Greenwich. As well as the improved transport links, new walking and cycle routes will be put in place which will effectively link the 200 acres of green space in Battersea park to the new Linear Park in Nine Elms, with access to the riverside itself being increased. We are very excited to see the changes coming to the area, and can’t wait for the rest of the development to be completed. We are very lucky to be involved early on with this project and are enjoying watching this new community grow. If you have any questions about the development at Battersea Power Station, then please do not hesitate to get in touch.